When I got up this morning, my brain automatically started flipping through a sleep-addled mental Rolodex, trying to remember what time the game would be on tonight for a few moments. But only a few. Then the heavy brick of reality hit me, and with a bit of a heavy heart, I got up to make coffee and check my email. I went to yesterday’s game in happy anticipation of trying some new food at the Terrace Club level and meeting our British friends, who are on a tour of the country right now. Also, perhaps one last win so that the Mariners record could end at 62-100. Shortly before we left, we got an email that our friends had stayed out far too late the night before (bars close around midnight in England) enjoying the kindness of some strangers while they were bar hopping downtown, and wouldn’t be able to make it. And the Mariners lost. The food was really the only thing that made it for us – except that the prime rib nachos were “good, but not $15 good” according to Tom. My crab panini sandwich, however, was absolutely marvelous. They do not mess around with the crab at ALL, and for $9.50, it’s a sandwich that would probably cost $18 or more in a restaurant (potato salad, guacamole, and delicious pickle spears included). Plus, we got to watch a baseball game in comfortable seats while eating said food, so I feel like we got our money’s worth, outside of all the losing. Yeah, so anyway, I’m not really sure where to go with this one. I took some 193 photos, most of which turned out after I uploaded and checked them for clarity. And despite the fact that we were sitting all the way down the right field line in section 212, the ones I cared about most came out very well. Normally, my ability to get shots of action are hampered by the Canon Powershot s5 iS’s eating of batteries. I love my camera dearly, but I have to buy batteries at Costco because it’s not very energy-efficient. Yesterday was the last game of the season, though, so I just kept the camera on and attached to my face for a vast majority of the game. And with results! Matt Mangini being declared safe at home. I believe this was our first run of the game. 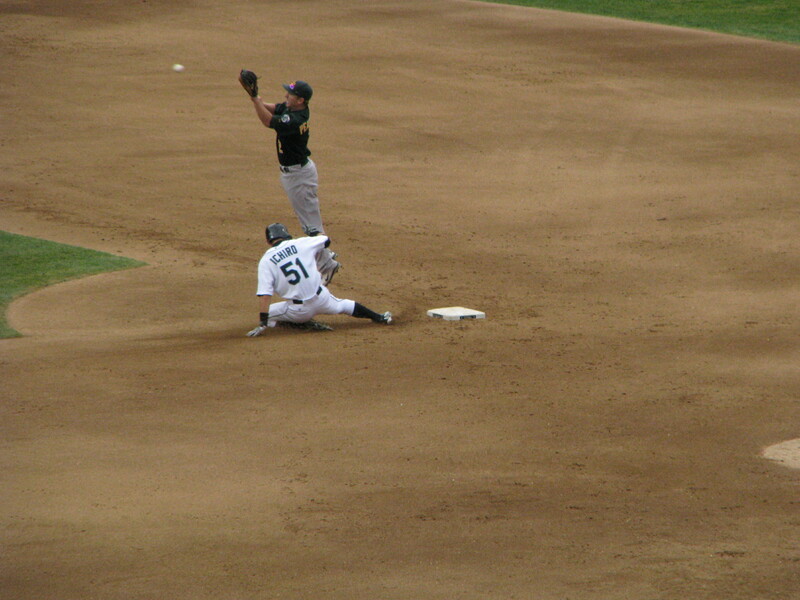 Ichiro steals second late in the game, his last steal of the season. I’ve wanted to get a shot like this all year. 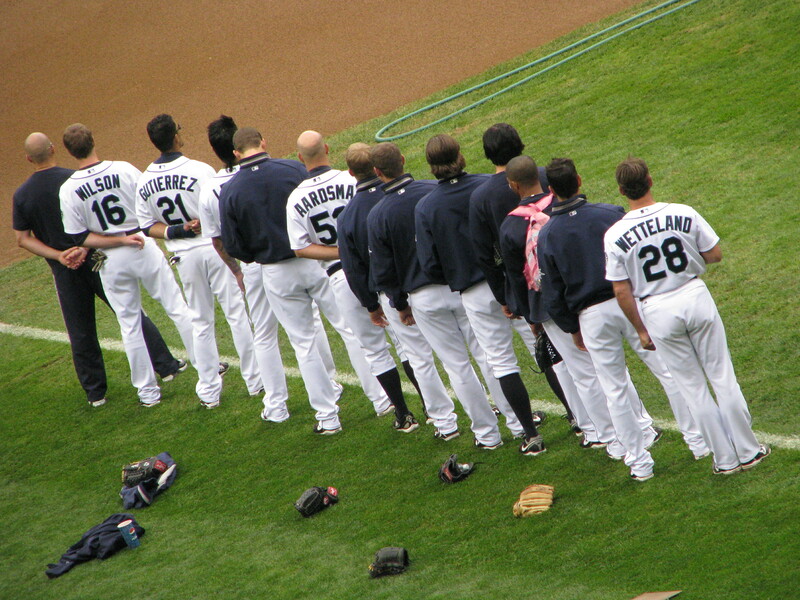 The Mariners pen with Josh Wilson and Franklin Gutierrez, standing for the National Anthem. I think that if John Wetteland has to be relieved of his duties for some lame reason during the offseason, this is how I will remember him and what he’s done for our bullpen. As someone who focuses on pitching in the game, I feel he’s made a huge difference not only in how Mariners fans view the bullpen, but in how the bullpen views itself. And I have immense amounts of respect for that. Stuff like this was really the clincher for me with Wetteland. The pen walked backwards until Dan Cortes caught up to them – they then turned around and walked forward, still in their line, back to their benches in center field. They are a team within a team. I think this is my way of saying that I will be fairly upset if Wetteland is let go in the offseason. Right now, I fear everything and anything. For me, Wetteland’s tenure here represents the Don Wakamatsu era in Seattle, and I miss that. I know that there were a lot of people who wanted Wak out this year, but I wish they (the fans and the organization) had given him more of a chance. I hope they give Wetteland more of a chance. 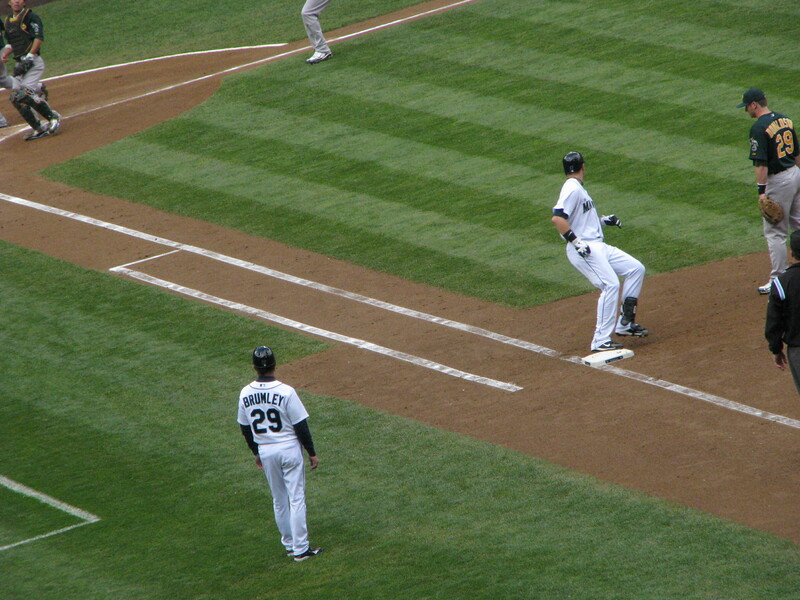 Justin Smoak makes it to first base, checking behind him to find that indeed, he was out by Kurt Suzuki’s hand on a pop-up. Smoak started heating up over the last month or so, and was not too shabby during callups here – at least, what callups we got a chance to actually have. I’d like to go on waxing philosophic about what I’d like to see next year, but I’m afraid that this season has just beat it out of me. We managed to imitate 2008 with a 101-61 record, coming in second last above the Pittsburgh Pirates this time, rather than the Washington Nationals. The season ended at home in much the same way it started – with Ryan Rowland-Smith on the mound, against the Oakland Athletics, and with a loss. It seems almost fitting, like the chapter of 2010 was closed, with no loose ends or questions about what was going to happen afterward. There was no victory march around the field, no acknowledgment of the season being over, no fanfare for the end of things. The thing there was, however, was John Wetteland staying about two hours after the game, autographing for and talking to fans. 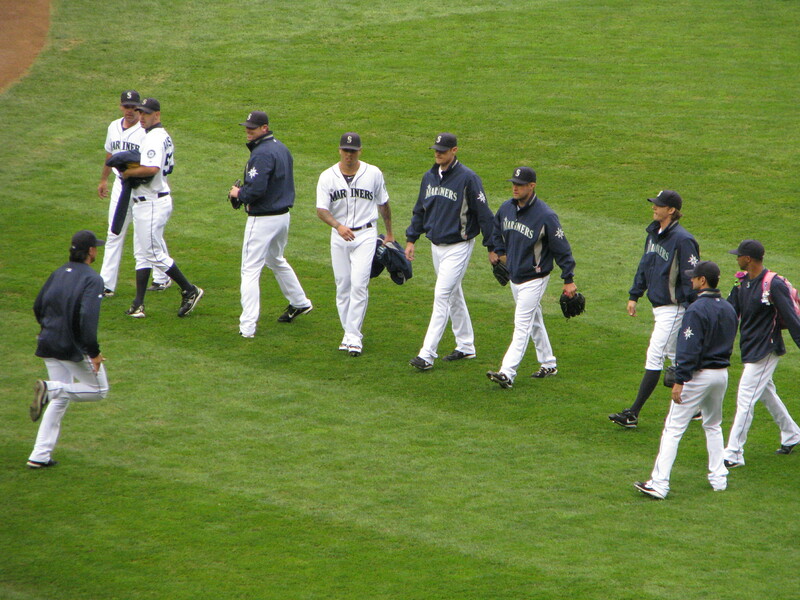 Then Wetteland took a look around the stadium and left the field. That’s it. 2010 is over, and…that’s it. I will spend this week watching playoff games I’m not really invested in, going to a show tomorrow night, getting in a little bowling maybe, and trying to just calm down a little. I walked back to my car with Tom yesterday, feeling both strangely relieved and terribly sad. It was a bizarre combination, one I don’t know that I’ve experienced before. I don’t know what to expect over the next 6 or so months. I didn’t want to think it was true, but somewhere in all of this the front office has lost a little of my trust. I don’t view them as some large entity that I need to worry about, but I’m fully prepared to keep a wary eye on them. I want to be hopeful for next year, but right at this very moment, today, I’m not ready. To leave off on a more positive note, however, there are many things that have made this season far more bearable than it could have been. There are too many people to list here, but I wanted everyone to know that if we’ve shared a word this year about baseball, it meant something to me – it made a difference. The Tacoma Rainiers and Everett Aquasox made a difference. People I’ve met in real life that love the Seattle Mariners and even other teams have made a difference. The other bloggers and reporters around the web, everyone on Twitter, the USSM/Lookout Landing event, Opening Day, the good folks in the Mariners marketing office (Happy cat bobble! ), all of that made a difference to me. I didn’t really have any of you last year, and certainly not in 2008. You made it bearable, and for that I can never thank you enough. So at least for that, for developing recent friendships and forging new ones in the name of baseball, I look forward to 2011. This year has been a hell of a ride. I need a bit of a break to stop the dizziness and maybe throw up a little, but after that, back to the grind. 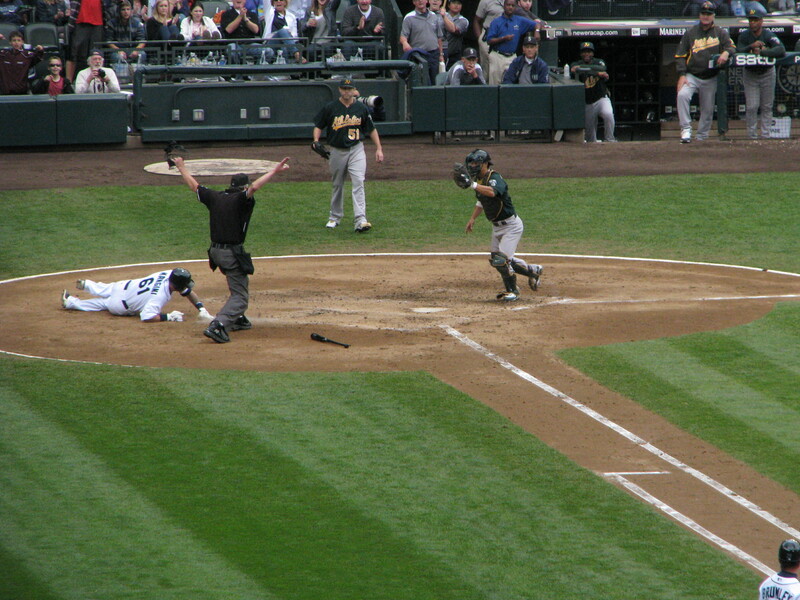 Pour out a glass for the 2010 Seattle Mariners, and raise one for 2011. Here we come. Normally, it wouldn’t bug me – but since we pretty much wiped the slate earlier this year, I guess I’m expecting another shoe to drop. Maybe everyone just needs a nice vacation, and we can come back in 2011 and be better…right now, though, I just need to watch some playoffs and not worry about it. I think that October might be the most relaxing month of baseball this year. Haha!